Leveraging the skills of our qualified team of professionals, we are instrumental in offering a wide range of Floating Jetty. Matching up with the requirements of our clients, we are involved in offering Floating Jetty. We are engaged in manufacturing and supplying of floating jet. This water equipment carries the features like rugged surface design, high strength, unsinkable, floating and resistant to weathering conditions. Dimension of floating jett is 8 ft x 8 ft. This equipment is manufactured using marine grade frp with honeycomb internal structure. We are well known name in India to manufacturer & supplier of HDPE Jetty in Mumbai. We offered customized HDPE Jetty in all over world. Apart of that we also have a vast exeprience in Marine products like HDPE Jetty, Jet Ski. Zorbing Ball & many more..
- Available to the customer at industry leading rates. Can be assembled in NO time for real time rescue and approach. Emergency evacuation by Rafts, can be a bridge OR can be a docking system for Boats. Floating docks are used for various purposes on water. Inco Mechel Pvt Ltd .! We would like to thank you for your interest in our offerings. Our organization is ranked amongst the reputed names in the market for providing Floating Jetty. Furthermore, we present this at nominal prices. 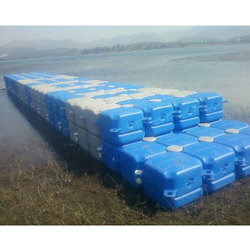 Professionals of our firm have offered these Floating Jetty products in the market. These products are compact in frame and weather proof in nature. In addition to this, these jetties are reliable and easier to use. 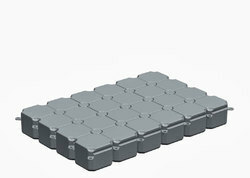 Moreover, professionals use optimal quality material for the manufacturing of these floating jetties.